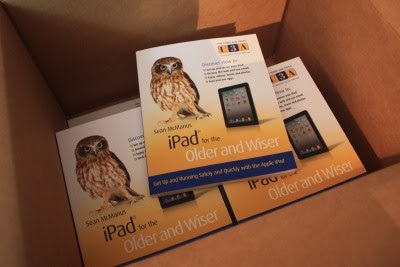 iPad for the Older and Wiser has now been published, and I've just received my box of author copies. Even though I've seen the laid-out pages for the whole book, it doesn't really look like a proper book until you've got the lavishly printed copy in your hand, so it's a good feeling to see all the months of work solidified in the finished product. The screenshots and photos have come out great, and Stephen Long has created some colourful cartoons to introduce each part. The book is also available in a range of digital formats for reading on ebooks, including Kindle and iBooks. In due course, I'll add links to those in my shop, but if you prefer digital, you can probably find the book by searching for it in your preferred store. Today I've also published the list of the top 20 best iPad apps which appears in the book. With my books, I try to provide links and other resources on this website to save readers having to search for things I can more easily just give them on this website. The online version has been enhanced with some videos demonstrating three of the apps, and links to all the apps so you can go straight to them in iTunes. Did I include your favourite iPad app? If you've got another to suggest, feel free to leave a comment or email me. Although I use Blogger myself for managing this blog, I typically recommend Wordpress as being more fully featured. I use it for some other blogs I write, and it’s a bit more flexible and more powerful than Blogger, especially for newcomers. I wrote a section outlining the basics of getting started with Wordpress in my book Web Design in Easy Steps. When I was looking around one of my Wordpress-hosted blogs recently, I discovered a new section in the Appearance section of the settings. If you log into your Wordpress dashboard, and scroll down, you should see ‘iPad’ in the Appearance section, on the left. These settings give you the option to upload an image that will be shown when someone launches your blog from an icon on the iPad’s home screen, and to upload a cover logo. 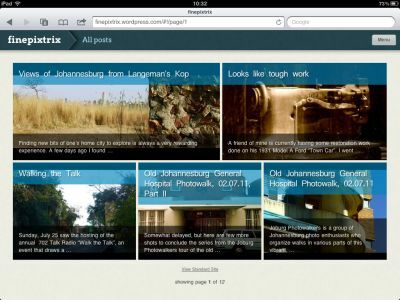 These help to give a visit to your blog a more native app-like feel on the iPad. By default, the option to display a special theme for iPad users is ticked, and you can confidently leave it ticked. Although I’ve been using the iPad a lot, especially while writing my book iPad for the Older and Wiser, I hadn’t visited any Wordpress blogs with it, so I was intrigued to see what this was all about. Basically, with the theme selected, Wordpress presents your blog in a format that is optimised for the touch screen and that will be familiar to iPad users when they view it. On the iPad, you see boxes containing headlines and a short summary of your story. When you tap one, a window opens to show the story in full which can be dragged up and down. To move between the pages of summaries, you swipe sideways to turn the pages. The whole experience is similar to the superb Flipboard app, which turns updates from social networks and your favourite websites into a magazine-like experience. If you have a Wordpress blog and want to offer iPad visitors a similar experience, the good news is that Wordpress is already doing it for you. However, you can make the experience even slicker by uploading a splash image and logo in your Wordpress settings. If you customise your blog for the iPad, leave me a comment and I'll check it out. Is it worth buying a 3G iPad? If you’re wondering whether you should get the 3G iPad or just get the Wi-Fi one, there’s a new tool from the BBC that might help you to decide. The BBC invited volunteers to download an app for their Android mobile phones, and the app tracked where mobile signals were available. In total, 44,600 people submitted 1.7 million hours of data across the UK. What it means for you is that you can enter a postcode on the BBC’s UK mobile coverage map, to see whether there is 3G coverage in that area. If the map is green where you live, it means there is coverage. If it’s purple, it means there is 2G coverage, which is slower but will still work on your iPad. The white areas have no data, which means nobody participated in the survey there. (It doesn’t matter that the data was collected using Android phones, because the iPad uses the same network). If you have somewhere you might want to use your iPad regularly and won’t have access to free Wi-Fi, it’s worth checking it to see what the 3G coverage is like there using the BBC’s map. Technology news site The Register warns that you should take the data with a pinch of salt: if there’s one square showing superior coverage to all the squares around it, that’s probably a blip in the data. But the data should be broadly accurate and is based on actual coverage experienced by people using mobile phones. As my book iPad for the Older and Wiser explains, Wi-Fi is usually free to use at places like cafes and in your own home. 3G requires a payment, typically a subscription that allows you to access a certain amount of data in a certain timeframe (such as 1GB in a month, which would be enough for about 200 songs or 10,000 web pages, according to O2’s estimates). Generally, I’ve found it helpful to have a 3G iPad for when I don’t have Wi-Fi coverage, including when in the car or when my home Wi-Fi network goes down. UPDATE: My Friend Mark who lives in Shropshire says: "Don't believe the map 100%... says I get 3g when in fact very occasionally I get an unusable 3g signal and most of the time I hardly get a 2g one!"